So given that the tea leaves look like that 1903 is coming soon, I’m making sure that I’m downloading 1809 from the media download site and parking it on a location so that when I’m ready to install 1809, I have it ready to go. Today the previews of next month updates came out for everything but 1809. So if you decide WHEN you want the feature releases, make sure you’ve deferred to the semi annual channel and have 1809 downloaded and parked for the future. JohnW 2 days, 9 hours ago. I downloaded 1809 Bld 17763.1 this morning to a Flash Drive for safe keeping. I’m still on 1803 but at some point I’m sure 1809 will be in my future. The 1809 ISO that you should be downloading should be at least the build 17763.107 version. the 1809 iso download that had build 17763.1 had the user file deletion problem and was pulled several days later and MS re-released the 1809 ISOs on Nov. 13, 2018, containing the 17763.107 version which fixed the problem. … and the Media Creation Tool has been creating 17763.253 ISOs for a couple of months now, that one seems to fix some more problems. I just tested Media Creation Tool which downloaded 17763.1. Ok, I officially label this thing WEIRD. That’s my first .253, I’ve gotten more of them since (again this week) but haven’t bothered to archive subsequent ones separately. mn--. Reason: Is the language version significant? I used the MCT this morning to create the USB ISO and to see what build it was, I right clicked on setup.exe>properties, that’s where I got that build number from. Maybe I am looking in the wrong place? It is the same for all other indices as well. Note: Use dism /Get-WimInfo /WimFile:X:\sources\install.esd /index:1 if the ISO was downloaded using the Media Creation tool. It say’s it can’t find the file specified. Got the same error. There is no install.wim file in this 1809 iso file. It seems really odd to me that previous downloaders of the ISO got current Bld’s and that the ISO today would be clear back to the 1st Bld. Evidently I am not looking where I need to be looking to find the Bld on this ISO unless MS played a switcheroo. 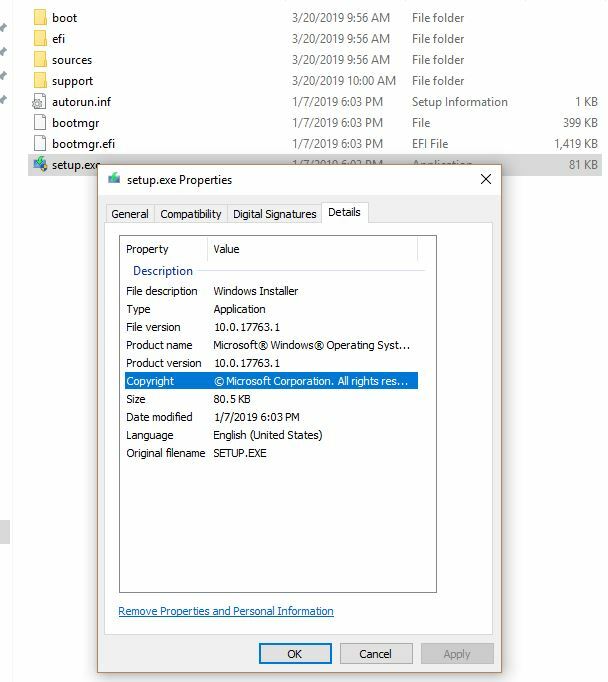 When you download a Windows 10 or 8 ISO file, by using the Media Creation tool, you will realize that there is an “install.esd” file under the “sources” folder (X:\Source\install.esd). The install.esd file is a compressed and encrypted file that contains a full copy of the Windows operating system in a protecting container. DISM can handle both these file formats (.wim & .esd), at least in Windows 10. Got the same. But I need Windows 10 Pro x64, Not Windows 10 Home. W10 ISO’s usually have ALL versions in them. The “Home” version is generic. Note: Use install.esd instead of install.wim where shown above if the ISO was downloaded using the Media Creation tool. I think my plan will be to keep 1803 people on 1803. I’ve updated around 10 pc’s from 1803 to 1809 with no problems but I want to see how this new build shakes out and perhaps later this year we standardize to 1903….we’ll see. New installs get 1809 but I’m not putting people through a version upgrade twice a year. I’ll just keep 1803 (and the iso I burned sitting on my desk) until 1903 is stable (the 1903 pain should subside after 30 days). Then I’ll just update from 1803 to 1903. Why would I want a copy of 1809 considering all the problems it has had and continues to have? Because the cost of materials and time is very small. Because having it on hand, not installed, does not harm your computing experience. Because things can always get worse. And when they do, having more options always beats less options. Even when you do not use those options. Think of it in terms of the same reasons you keep multiple backups in different locations. For some this seems like overkill. But a lot of geeks were scouts. And “Be prepared” sticks with you. Because why would I want something that has been proven broken and Microsoft has proven incapable of getting fixed? I would never download 1809 because I would never install something that broken. Well the .253 is actually quite a bit less broken than some others. In particular it would ATM be my installer of choice for starting to bring old/neglected W10 systems up to current, unless there are some of those applications where it’s contraindicated (old “Access format” databases as one example). Say, upgrades from 1511 or 1607 or… because it seems to behave better with drivers than upgrades to 1803. What do you feel is broken? Specifics please. Bear in mind I’m using it professionally and don’t find it particularly broken. I am not someone who likes or approves of W10… and yet I’ve downloaded an ISO for every version. When I have extra time and energy, I can check it out on a VM, especially since I’m the sort that does better seeing and experiencing, rather than just trying to learn its terminology at a greater distance. It certainly helps to be on the same page as other people. Some ISO versions I’ve used on friends’ computers. Its amazing how someone will need something once it is no longer available. It is a sometimes useful resource and cheap insurance… and although 1809 has had its share of problems, it is currently at its most stable. Based on past experience, it is unlikely that 1903 will start out more stable than 1809 currently is… and if someone gets a new computer after 1903 is pushed out, they may well want to go back to an older, more stable version. It isn’t unheard of an update failing, and then rolling back versions failing (hmm… seen it, been there). An ISO is invaluable at that point. And yes, whether its my computer, or a friend or family member’s, I’m compulsive about backing up, so the data is never at risk. I’m contemplating bringing ‘olde faithful’ W7 Pro image back online for curiosity in the run up to EOL (hardware install not VM) I’d rather counter something that is worth it’s weight in gold to me that has given so much computing pleasure over the years (same ilk as XP, W2k pro and the 98SE-gaming m/c). When the time comes, I’ll disconnect W7 from the interweb and keep it running prior to eventual hardware failures and a funeral service.. I’m sorta fortunate in a way having W8.1 also on devices but, I’m even more wary of every patch now and in the future..
MOUPG GetWebSetupUserInput: Execute: Download Url X64 = [http(...)/17763.253.(...).esd]. you learn that ‘boot.wim‘ is a container for both Windows PE and the Windows Setup and that ‘install.esd‘ is a compressed, encrypted copy of several OS “editions” in a protecting container (as noted here). In fact, these two files act as the core elements of how the “BASELINE” ISO gets “updated” to the more recent build being offered (currently, v10.0.17763.253)! I deleted Folders C:\$WINDOWS.~BT, and C:\ESD, but had to turn on “Hidden Files/Folders to see C:\$WINDOWS.~WS before deleting. Just a “Heads Up” if you don’t see the WS folder. I see that it was mentioned at the start of the helpful instructions but I previously missed it. I did this on my Win 10 Pro 1803 workstation, but I also have a laptop with Win 10 Home 1803. Can the same installer be used to update either a Pro or Home edition? yep just add and ei.cfg to your sources folder, just copy and paste the following in to a notepad file, save as “all files” with the name ei.cfg toss it in to the Sources folder either Burn .iso or recreate the .iso and you get a choice or which version during install, just check per advice above as to what indices the .wim or .esd contain, likely in any event, Pro and Home will be in there. Handy for those that upgraded to Pro or the Bios does not have a key for Pro, which will give you the default Home and saves the hassle of doing an upgrade later. When I ran the Media Creation Tool for 1809 I was puzzled that it did not ask about which edition of Windows 10 to build for (Home or Pro, etc.). The only edition available in the tool was “Windows 10”. See “Fido: Full ISO Download Script (for Windows retail ISOs)” for “A PowerShell script to download Windows retail ISOs”. Fido is a PowerShell script that is primarily designed to be used in Rufus but that can also be used in standalone fashion, and that automates access to the official Windows retail ISO download links. I have tested both, Rufus beta and Fido script. Both failed with the same ‘Internet explorer…’ error on my 1803 Pro. I just downloaded the 1809 version today (Media Creation Tool to create and burn to USB rather than saving the ISO), and I also got v 10.017763.379 as confirmed by running DISM cmd. I wonder when/if they’ll replace the ISO with April’s updates? Probably soon. I just updated a recalcitrant laptop today to 1809 that has been stuck on 1803, by going directly to the Microsoft website and clicking “update now”. It seems that I received 10.017763.437 (the April update). As there was no monthly update for April waiting for me after the feature update, I ran “Winver”, and sure enough I was up to date!